Over the past week or so, there has been a picture floating around the internet. 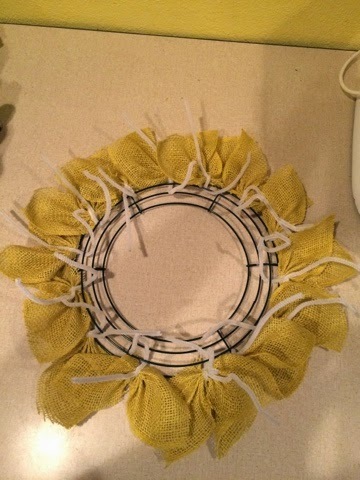 A sunflower mesh wreath. I knew once I saw it that I needed to give it a try. A few friends even tagged me in different posts on Facebook saying, "Chas! This looks like you!" or "Hey, Chas! Try this!" I loved it and wanted to give it a go. 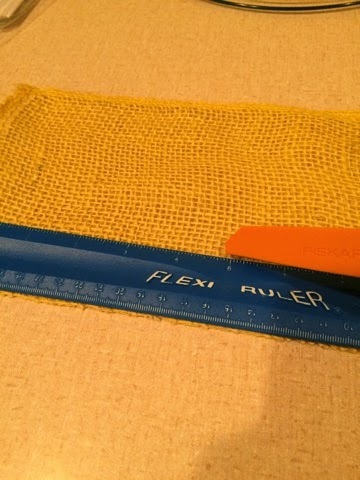 I measured to see how wide the deco burlap ribbon/mesh was. 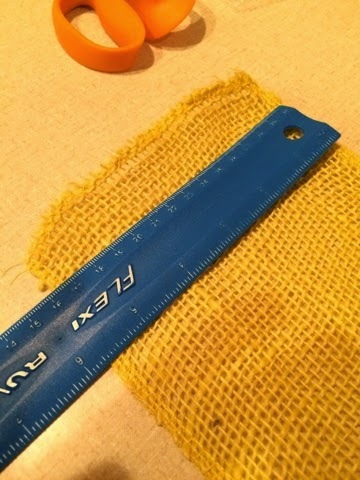 It is almost 6"
So I cut them 6" long as well, that way they would be somewhat squarish. 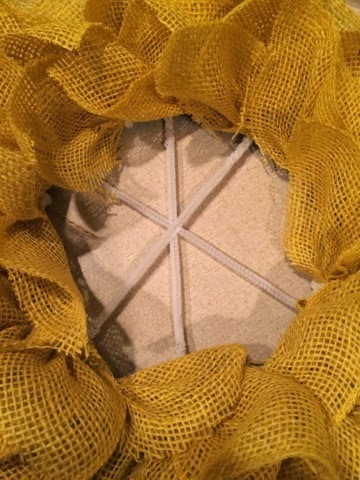 Now, turn the square slightly so that it looks more like a diamond. 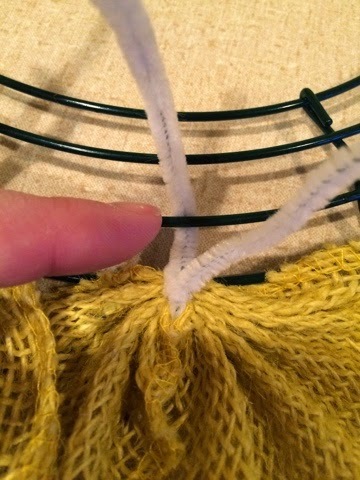 Beginning one the bottom corner (the one closest to you) pinch it up till you get to the other side... like the picture below. 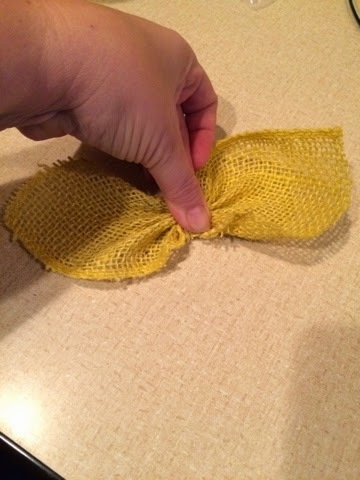 On the outer loop of your wreath, take a pipe cleaner and attach the pinched mesh and twist to keep it secure. 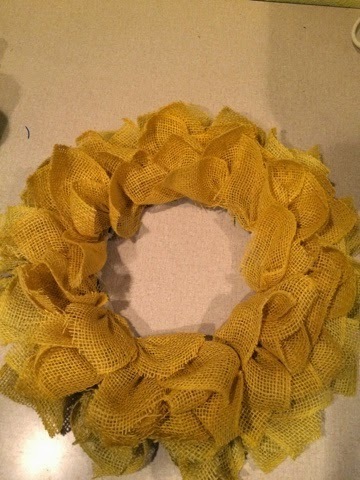 I did about 2 per section on this wreath. 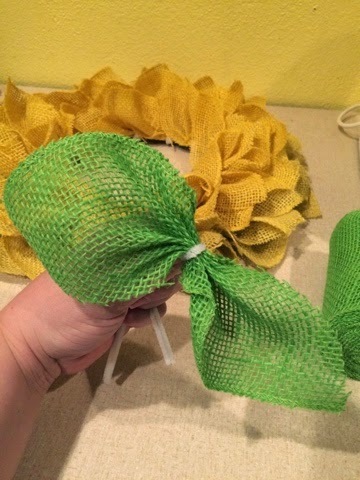 With one piece of the pipe cleaner, make it go under the next loop of the wreath so you once you finish going all the way around with your first layer, you can come back and begin your second layer of petals on the next loop. Continue forming petals all the way around the wreath. After you make another petal, continue moving your pipe cleaner section to the next level... getting closer to the final round each time. This is how it should look when the final layer/round is complete. With the green, I cut about an 8" long section. 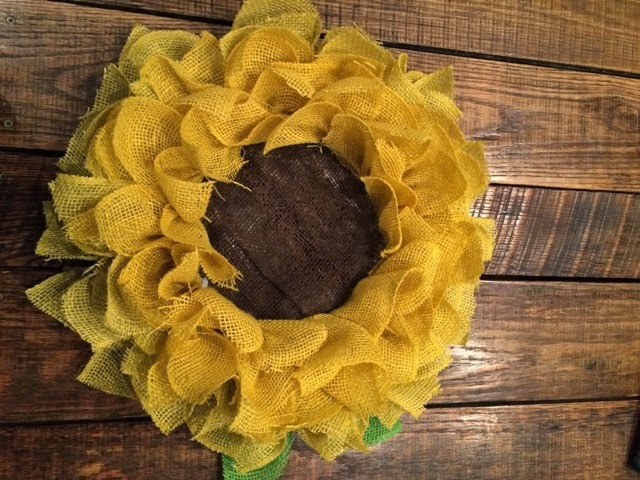 Pinched it in the middle just like I did with all the yellow petals and then wrapped a pipe cleaner around it to secure the leaf. 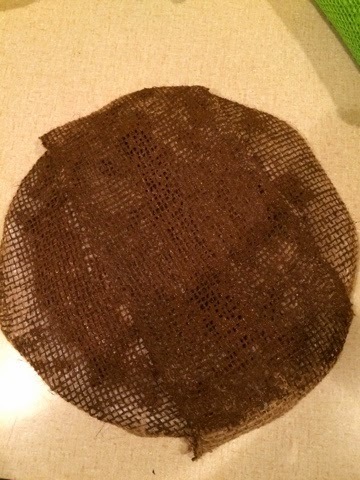 Then I attached the leaf to the outer ring and pulled the leaves outward so they would show. 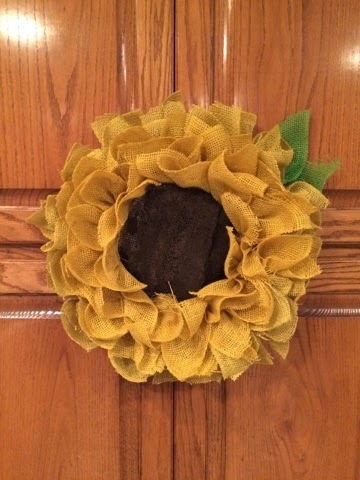 With this wreath, there is no place to "hold" a center section. So I took three more pipe cleaners and attached them in a star pattern. 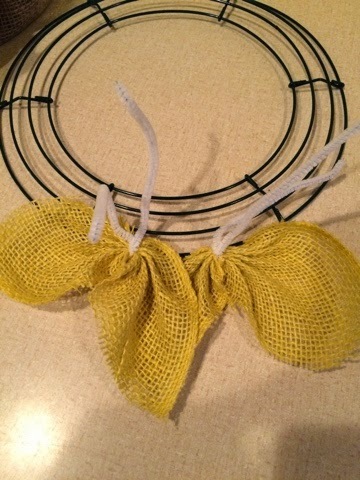 Fastening them to the centermost wire ring so it will hold our middle section of the flower. 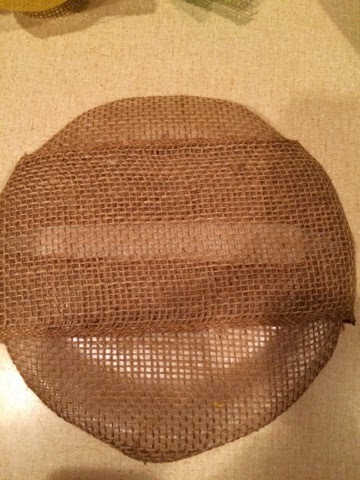 Then I wrapped a styrofoam circle with the brown burlap. 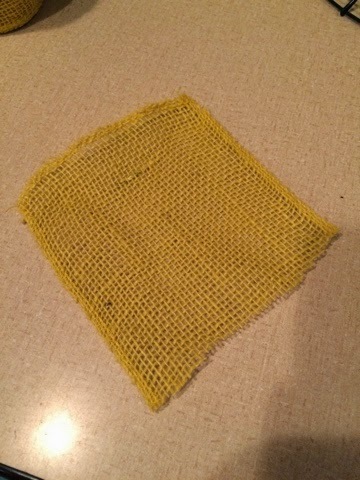 I WISH I had the dark brown burlap mesh, but I don't. So I wrapped it with regular and then painted it brown. It doesn't turn out perfect, but I like the imperfectness of it! 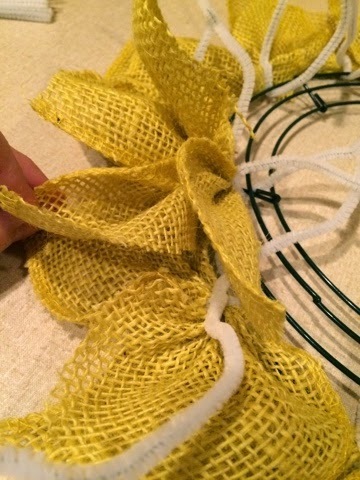 Fasten your middle section to your flower by hot gluing to the star shaped pipe cleaner section that you made on the back of the wreath. 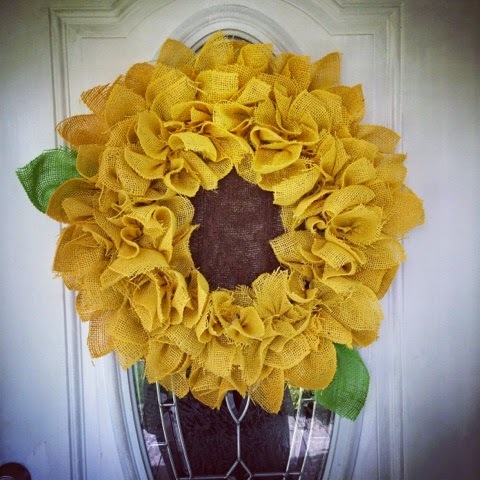 And there you go... A beautiful sunflower for your door or anywhere in your home! 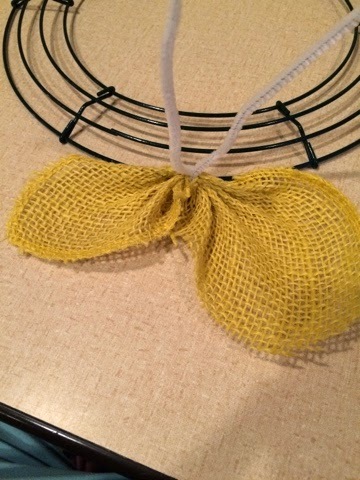 How would I make this using an 18 inch wire form? Also what size of styrofoam circle do you think I should use? This is my first time making something like this so I am a little lost...any thing would help!! Thank you!! How would I got about making this using an 18 inch wire form! 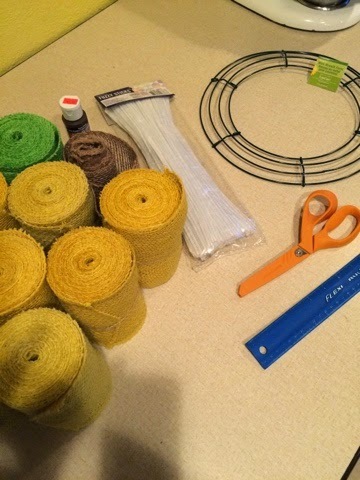 Also, what size styrofoam circle do you think I should use? Anything information or tips would help me tremendously!! Thank you! !